Pasta dishes are very common in the whole of the Dodecanese region. You will find simple pasta dishes like the one in Halki in most of the villages in Rhodes, Halki, Tilos and the rest of the islands. The Dodecanese were under Italian rule from 1912 to 1945, after the end of World War II. In difficult times, people had to survive on whatever produce was available to them, so making pasta with water and flower was an obvious choice for energy and nutrition, a sort of peasant food. Today this pasta dish is mainly prepared on special occasions and festival, to celebrate today with an ode to the past. 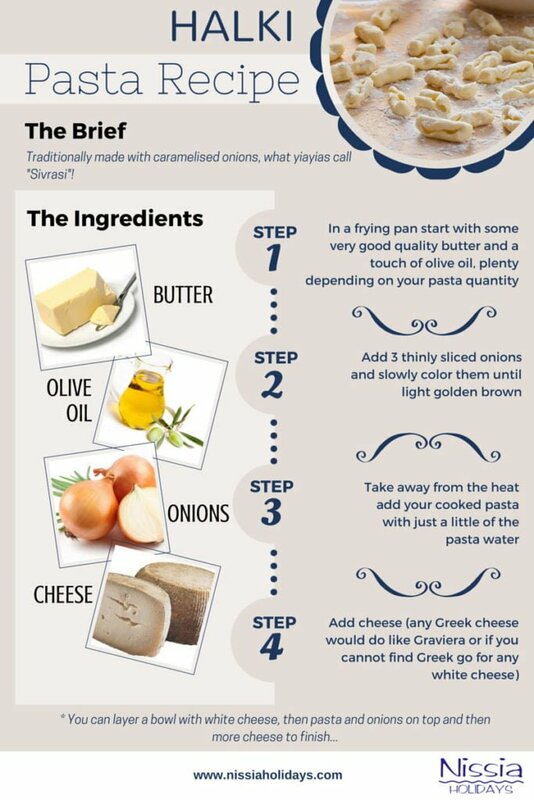 You can layer a bowl with your cheese, then pasta and onions on top and then more cheese to finish. You may also finish with a little extra olive oil and pepper. I’m off to prepare a bowl for myself now! Halki is one of my favorite places on earth, especially Kania Beach. I’m so happy to have this recipe to make at home.